4/13/19 - NCMP will be CLOSED all-day Sunday April 14th. 3/28/19 - KRA Race #1 POSTPONED - KRA Race #1 will be ran on Saturday April 6th and KRA Race #2 will run on Sunday April 7th as scheduled. NCMP will be open on Saturday March 30th from 10am to 5pm for practice and garage owners. NCMP will be closed on Sunday March 31st. TaG Senior, TaG Junior, Yamaha Senior weights have gone up along with Shifter. See the classes page to make sure you know what minimum weight your class is now. 3/21/19 - KRA LO206 Class Update - Due to supply issues KRA will allow the non-Briggs logo Champion RC12YC Spark Plug to be used at the first two rounds of the KRA Series. The Briggs Logo RC12YC spark plug must be used in all LO206 Briggs classes starting with Round 3 of the KRA Series on May 12th. 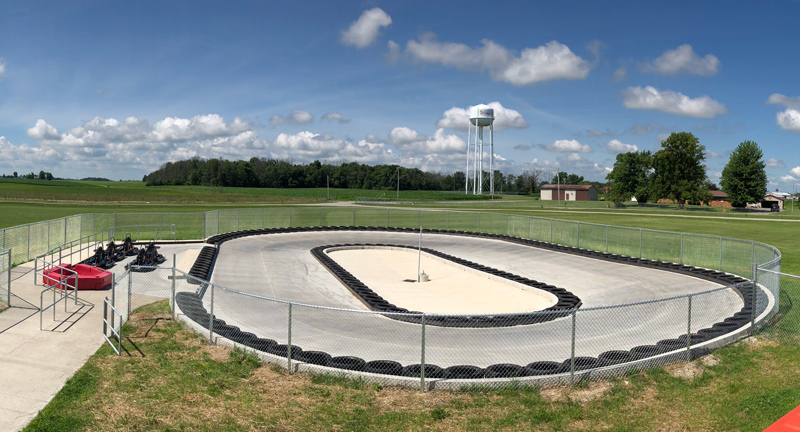 3/20/19 - NCMP is open for the 2019 Karting Season! See our hours page for details. 2/16/19 - As mentioned at the Kart Racers of America banquet, KRA will have a members meeting on Saturday March 2nd to discuss classes and all things KRA. The meeting will be free and NCMP will provide pizza and soft drinks. Doors open at 11am, food and drinks at 11:30am and the meeting will run from Noon to 2pm. Our online form for sign up is now available. Please RSVP by February 28th. 1/19/19 - New Castle Motorsports Park is happy to present our 2019 Race and Event Schedule! The KRA Series will run a 14 Race series again this season and NCMP will also host numerous Regional and National events in 2019. We look forward to another exciting and fun year of kart racing at NCMP! The 2019 Kart Racers of America Series will have a couple class changes in 2019. KRA will have a combined but scored separate Mini Swift/Micro Swift class in 2019. To not add more classes and time to the race day, Yamaha Jr. Sportsman will go from 2 classes to 1 in 2019. Also in 2019 the KRA Series will permit left hand drive Briggs engine karts in the Briggs LO206 Cadet class. With a season of watching the left hand drive karts race at many events outside of KRA, we have not seen an on track performance advantage with that engine location and are confident with the parity with either engine location. We will update the KRA class page very soon with the new information as well as our preentry page. 1/16/19 - Happy 2019! We are finalizing the 2019 KRA and NCMP schedule and we hope to post it very soon! 10/30/18 - The 2018 KRA Series Banquet RSVP form is now available. The banquet will be on Saturday, December 8th. You must attend the banquet to receive your awards for the year. 10/30/18 - NCMP will be closed on Wednesday October 31st due to inclement weather. 10/18/18 - Here is the race weekend schedule for the 2018 NCMP 125 LO206 Endurance Race. Also we have increased the purse for the 2018 NCMP125! Entries are still open for the NCMP 125. You can see the current entry list here. We are up to 34 teams and know there are a few more teams that have yet to enter, so we are looking at a good field of karts for this years race! 10/15/18 - We have posted the 2018 KRA Series final points for the season. One Excel file is total points and the other file are the final points with the three race drops that are allowed. The file with the drops is used to calculate the points champion in each class. Please take a look at your points and contact the track if you think there is an error in your points total. Congratulations to all the class champions and we will post banquet information soon! Entries are still open for the NCMP 125 LO206 Endurance Race on October 20th and 21st. You can see the current entry list here. We are up to 34 teams and know there are a few more teams that have yet to enter, so we are looking at a good field of karts for this years race! 10/10/18 - NCMP will have open practice and rental karts from 10am to 3pm on Saturday October 13th. At 3pm Lanternfest will start and must have a Lanternfest ticket to stay on the grounds. NCMP will have rentals karts available for Lanternfest attendees until 6pm. Please see our dress code and age requirements for the rental karts. The NCMP 125 is a 125 lap endurance race for LO206 CIK karts around the famed New Castle Motorsports Park! This race also features pit stops and optional driver changes. Practice and qualifying will take place on Saturday, October 20th with the race on Sunday, October 21st. Last year's race had over 40 entries and we hope to meet or exceed that number this year! 10/3/18 - NCMP has an event on Saturday October 6th from 10am to 1:30pm. So we will have a revised practice schedule for Saturday. 10/2/18 - The 2018 KRA Series Season Finale is this Sunday October 7th! Hard to believe an entire KRA Season is almost in the books again. The pre-entry page is up and running if you'd like to save time and money and enter online. 9/17/18 - There are only two races left in the 2018 KRA Series season if you can believe it! This Sunday, September 23rd is the 13th round of the KRA season. The pre-entry page is up and running if you'd like to save time and money and enter online. 9/15/18 - The entry page for the Second Annual NCMP 125 LO206 Briggs Endurance Race is now open! The NCMP 125 is a 125 lap endurance race for LO206 CIK karts around the famed New Castle Motorsports Park! This race also features pit stops and optional driver changes. Practice and qualifying will take place on Saturday, October 20th with the race on Sunday, October 21st. 9/12/18 - This weekend is the WKA Manufacturers Cup race at NCMP! This is a great chance to compete against top level National Competitors or to come out and watch some great racing! The weather looks nice for the weekend as well, we hope to see you there! 9/6/18 - With inclement weather forecast for Friday through Sunday NCMP will be open from 10am to 6pm daily unless there is rain. In the event of rain NCMP will be open from 12pm to 4pm for garage owners only on those days. Please call us ahead of time for clarification if need be. 9/5/18 - NCMP will close at 5pm on Thursday September 6th so the staff can attend the Race for Riley Progressive Dinner. If you are interested in attending this charity dinner in Indianapolis tickets are available here. 9/4/18 - The 2018 Race for Riley is this Wednesday September 5th at NCMP! The track will be unavailable for practice and rentals on Wednesday. The KRA Series is off the next couple weekends but NCMP will still be open for practice and rentals this weekend. The big track is not available on Saturday until 1:30pm for practice and rentals. The slick track will be available all day on Saturday. Starting the week of September 10th, NCMP will be closed on Monday's and Tuesday's until the end of the season. 8/28/18 - The KRA Series is back in action again this Sunday, September 2nd for the 12th Round of the 2018 season! The pre-entry page is up and running if you'd like to save time and money and enter online. NCMP will be closed on Labor Day, Monday September 3rd. 8/20/18 - After a mid-summer break the KRA Series returns this Saturday and Sunday with a Double Header weekend! The pre-entry page is up and running if you'd like to save time and money and enter online. 8/15/18 - In the event of rain Thursday August 16th, NCMP will be closed. Please call ahead before coming out to the track. 8/6/18 - NCMP will be closed Tuesday and Wednesday August 7th and 8th, there will be no practice or rentals available either day. The facility will only be open to SKUSA competitors per the SKUSA schedule. 7/31/18 - Saturday and Sunday August 4th and 5th will be the SKUSA Tune-Up test weekend. The Tune-Up will have SKUSA classes only with practice broken up into groups. SKUSA Tune Up practice will be available from 10am to 6pm both days. Rental Karts will be available on the east track all weekend as well as the slick track. 7/23/18 - NCMP will be hosting the final round of the 2018 United States Pro Kart Series this weekend! With champsionships on the line it should be a fun weekend to bring out the family for some fun karting action! 7/16/18 - This weekend (July 21st-22nd) NCMP isn't hosting any races which means lots of track time for rentals and open practice! NCMP will be open Saturday and SUnday from 10am to 6pm. 7/11/18 - KRA will offer Micro Swift, Mini Swift and KA100 on Sunday July 15th at the KRA Series race. Those classes will run at the end of the rotation. 7/9/18 - It's another KRA Series Double Header weekend! We're already into the second half of the 2018 KRA Series Season! The pre-entry page is up and running if you'd like to save time and money and enter online. 7/2/18 - NCMP will be closed on July 3rd and 4th. Any garage owners needing to access their garages will need to do so this weekend or make prior arrangements for the 3rd. 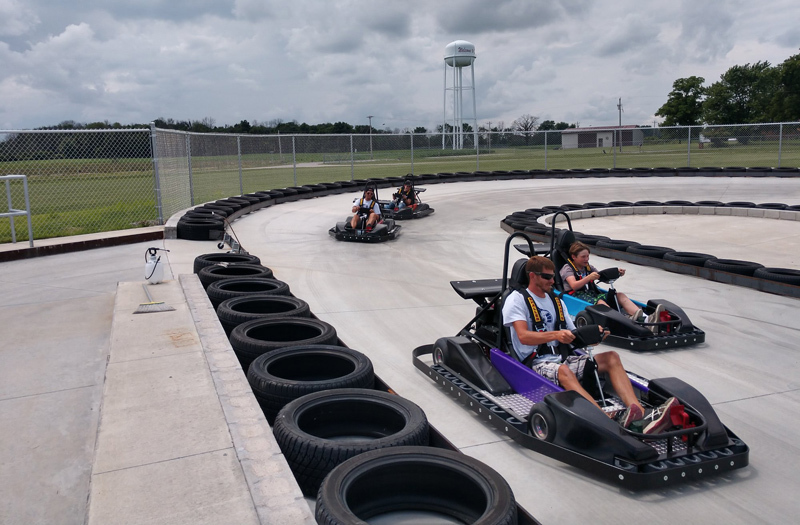 6/25/18 - The NCMP Slick Kart Rental Track is now open! There is no age limit on this track but riders must be at least 54" tall. There are also no helmets required and you can wear shorts and open toe shoes. First ride is $10.50 for 5 minutes, each ride after is $7.00, four rides for $28.50. We look forward to seeing everyone sliding around! 6/19/18 - It's a KRA Series Double Header weekend! The 7th and 8th round of the 2018 KRA Series season will take place this weekend and it also marks the halfway point in the season already! The pre-entry page is up and running if you'd like to save time and money and enter online. 6/11/18 - Following a vote among the LO206 competitors at the KRA Series race last weekend, KRA will NOT allow the new OTK M7 nassau panel in any KRA LO206 class. 6/3/18 - We have posted the layout for Sunday June 10th's KRA Series Race. On Saturday we will run the Sunday layout on the main track minus the oval section. On Sunday we will have two rounds of practice and an extended qualifying. The pre-entry page is up and running if you'd like to save time and money and enter online. 6/1/18 - NCMP has corporate events all day Sunday June 3rd so there will not be open practice available at all on Sunday. Rental karts will be available from 2pm to 6pm on the East Track Sunday. NCMP will be open all day Saturday for open practice and rentals. 5/29/18 - Lanterfest that was scheduled for Saturday June 2nd has been postponed until October 13th. The track will be open for kart rentals and practice this Saturday. 5/25/18 - NCMP will be closed on Sunday May 27th for the Indy 500 and open Monday May 28th for Memorial Day with open practice and kart rentals. 5/19/18 - NCMP will be closed on Tuesday May 22nd and Wednesday May 23rd for track repair. NCMP is closed on Monday's. 5/14/18 - This Sunday May 20th is more KRA Series fun with the fifth round of the 2018 KRA Series kart club season! The pre-entry page is up and running if you'd like to save time and money and enter online. 5/11/18 - With Sunday being Mother's Day, KRA will have a Mother's Day time trial! 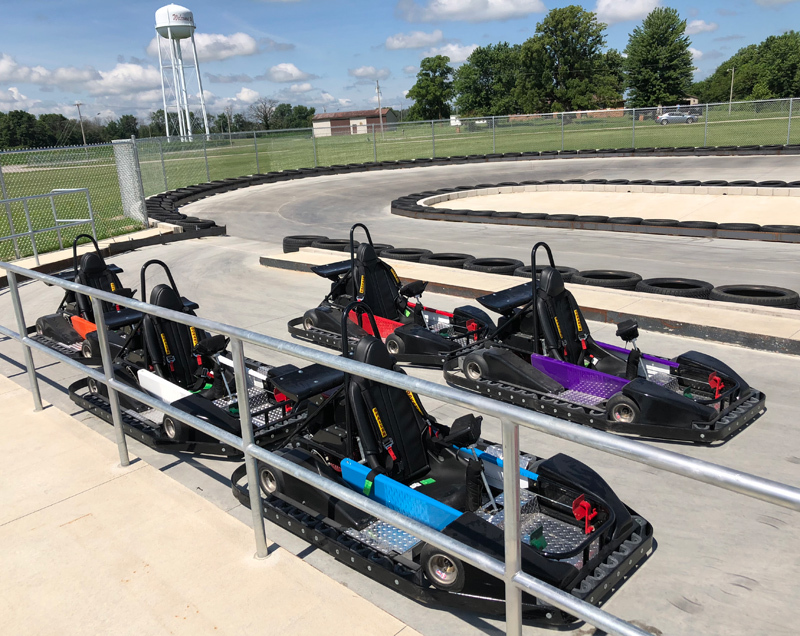 It's free to sign up at the track for the KRA Race Mom's, each will get a session in the NCMP Rental Karts after KRA Qualifying and the top 3 times will receive prizes! We look forward to seeing you all on Sunday! 5/8/18 - This Sunday May 8th is the fourth round of the 2018 KRA Series kart club season! The pre-entry page is up and running if you'd like to save time and money and enter online. KRA TaG Class Update - All KRA TaG Classes will be allowed to run YLC or YNB tires. X30 engine rules will be aligned with SKUSA with the exception of the following parts (parts must still measure the same as OEM) clutch drum can be aftermarket, clutch sprockets can be aftermarket. Spark plugs allowed NGK R6252K-105 or BR10EG only. 4/18/18 - KRA will be offering Micro and Mini Swift at this weekend's (April 22nd) KRA Race as a tune up for the upcoming Route 66 Series race. We have added the classes to the online pre-entry form. 4/11/18 - The KRA Series WILL BE RACING SUNDAY, rain or shine! Since Mother Nature doesn't want to cooperate we will just take what we get! We hope to see you this Sunday April 15th for the 3rd Round of the KRA Series even though it will be the first actual race of 2018! The pre-entry page is up and running if you'd like to save time and money and enter online. 4/9/18 - Despite two race postponements and winter trying to hang on we are hoping to get Race #3 of the KRA Series in this coming Sunday April 15th and finally kick off the karting season at NCMP! The pre-entry page is up and running if you'd like to save time and money and enter online. 4/4/18 - It doesn't look as if mother nature is going to cut us any slack this weekend either. Unfortunately, we will be postponing KRA #2 for a later date. We have scheduled one of the make-up dates for July 14th which will make that weekend a double header. We have not decided yet where to put the second date but we will keep everyone updated as the information becomes available. The spring NCMP 125 Briggs LO206 endurance race is coming up quick on April 21st-22nd! You can enter the NCMP 125 Race #1 on our pre-entry page. The NCMP 125 is a 125 lap endurance race for LO206 CIK karts around the famed New Castle Motorsports Park! This race also features pit stops and optional driver changes. - All karts will grid up for the race with empty fuel tanks and NCMP will supply the first 2 liters of fuel. This will ensure all karts will have at least one pit stop without enforcing a tank size limit. 4/3/18 - NCMP is closed today (Tuesday April 3rd) due to inclement weather. KRA will not allow Left Hand drive karts in the LO206 class. All karts must have the engine on the drivers' right hand side of the kart and must use the standard RLV 5507 Exhaust Header Pipe with muffler. 3/31/18 - NCMP is open today (Saturday March 31st) for practice from 10am to 6pm. NCMP will also be closed on Sunday April 1st for Easter. 3/21/18 - KRA RACE POSTPONED - With the prediction of several inches of snow and low temperatures this weekend the 1st round of the KRA Series has been postponed. We do not have a make up date at this point but we will announce one as soon as possible. We are as disappointed as you but this time of year it can be 70 degrees or 40 dregrees. We look forward to KRA Series Race #2 scheduled for Sunday April 8th! 3/20/18 - We are still having a tough time catching a break from mother nature. NCMP will be closed today (Tuesday March 20) and tomorrow (Wednesday March 21) due to weather. We are also actively watching the forecast for this Sunday. Due to the fact that quite a few racers begin their travel on Friday afternoon we will make the call whether to postpone by Friday at noon. 3/19/18 - This Sunday March 25th is the first round of the 2018 KRA Series kart club season! The pre-entry page is up and running if you'd like to save time and money and enter online. It's been a long winter but spring is finally here and so is the karting season! 3/6/17 - This Saturday March 10th is the NCMP Engine and Chassis Technical Seminar Presented by Comet Kart Sales. We've had a great response so far to the seminar and if you are planning on attending we would appreciate if you would sign up in advance to make registration morning quick and easy for everyone. A complete rundown is available on the flyer here. Adults are $40 each with kids 14 and under $10 each. We will have coffee and snacks starting at 8:30am with the seminar starting at 9am and running until 2pm. Lunch will also be provided. You can sign up for the seminar on our website or you can print the form and email or fax it to the track. Please RSVP by March 5th. 2/21/17 - On Saturday March 10th NCMP will host an Engine and Chassis Technical Seminar Presented by Comet Kart Sales. The seminar will be hosted by multi-time WKA National Champion Gary Lawson and will cover a range of topics. Synopsis - This seminar is intended to equip new and experienced racers with the knowledge and skills to become more confident and independent working on their kart with the goal of achieving enhanced results. Extensive demonstrations will be provided to ensure understanding of each area of focus. Topics will include but not limited to - Sniper Laser Alignment, Chassis Scaling, Carburetor and Air Filter Maintanance, Tire Tech, Clutches, Basic Mychron Use, plus Q&A. 11/9/17 - As the weather is getting colder NCMP will be closing for the season. Our last day open will be Sunday November 12th. If you are a garage owner and would like access to your garage following that date you will need to contact us on Facebook or via email. We appreciate everyone who helped make 2017 a success and are already looking forward to 2018! 10/26/17 - The 2017 KRA Series banquet will take place Saturday December 9th, doors open at 11am. RSVP's must be received by November 20th. You can download the form here if you want to mail a check or you can use our online form if you wish to pay by credit card. 10/24/17 - We are over the 40 team entry mark for the first annual NCMP 125 Briggs LO206 race and the race is a go! We are looking forward to a fun event with a purse over $3000 and lots of on track action! We will see you this weekend! Any entries received after that date or at the track will be an additional $100.00, so enter now! We will not be issuing any refunds after the pre-entry deadline. This event requires a lot of people, ambulance, fencing, etc. and is not cheap for us to put on so we need the full commitment from everyone that enters this race. We want to put on a great event, something that we can build on for years but we only want to host such a race if there are racers willing to attend. You can enter the NCMP 125 on our pre-entry page. 10/9/17 - The NCMP 125 Briggs Endurance Race is fast approaching! Please get your entries in as soon as possible, we have to order tires for the event and need an accurate count of entries that will show up. See the 9/30/17 news update for all the information on the race and we look forward to seeing you there! You can enter the NCMP 125 on our pre-entry page. 10/5/17 - This Sunday October 8th is the 2017 KRA Series finale! The pre-entry page is up and running if you'd like to save time and money! Click the link to enter online. 9/30/17 - NCMP is happy to announce details on the NCMP 125 Briggs LO206 Endurance Race scheduled for October 28th and 29th. The NCMP 125 is a 125 lap endurance race for LO206 CIK karts around the famed New Castle Motorsports Park! This race also features pit stops and optional driver changes. 9/28/17 - Robopong News - NCMP has decided after much debate to cancel the 2017 Robopong 200. This year was most likely the last chance for this event to happen and we hoped with some changes it might still be a viable event but the changing landscape in karting, primarily the decline in TaG racing, has made it almost impossible to find enough teams to enter the event. We had discussions on switching to LO206 but the Robopong 200 was founded as a TaG event and we felt it needed to stay a TaG event or not happen at all. It feels like a passing of an era, the Robopong 200 featured some amazing races, giant field sizes and some of the best race car drivers on the planet racing wheel to wheel with club racers, national racers and future Indycar stars. We are sad to see such a fun and unique event fade from the sport but we hope that conditions in karting will change and allow a successor to the Robopong 200 to eventually take it's place. Thank you to all who competed in this event in the past and to those who entered this year. 9/19/17 - KRA LO206 Class Update, Effective Immediately - At the race director’s discretion, the track may ‘claim’ a competitor’s Briggs LO206 engine at any time. The track will supply the competitor with a new, factory sealed engine in direct exchange for the competitors ‘as raced’ engine. If the competitor fails to comply with the claim request, the competitor will be excluded from participating for one year and will forfeit all points acquired to date. The same will apply if a claimed engine is found to be blatantly illegal. KRA is making every effort to keep the LO206 class pure and to the spirit and intent of the class. A low cost, economical class that allows inexpensive racing to all karters; where driver ability and chassis tuning are the haulmarks of the class. A class where engines; whether they come from the factory better than others or are deliberately altered are taken out of circulation for engine parity alone. We do not want special engines to discourage any karter from racing because they feel they can not compete or give anyone the perception that you have to have a "special" engine to win. NCMP is closed today, Tuesday September 19th, due to weather. Going forward NCMP will be closed on Monday's and Tuesday's as the season winds down. If you need into the facility on a Tuesday please make arrangements with the track ahead of time. 9/18/17 - The KRA Series is down to it's final two races of the season! This Sunday September 24th is the make up date for a race that was postponed in April due to bad weather. Everyone is welcome to enter. The pre-entry page is up and running if you'd like to save time and money! Click the link to enter online. 9/12/17 - This Saturday and Sunday are rounds #12 and #13 for the 2017 KRA Series! After this weekend only two KRA races remain! We have KRA #3 that was postponed due to weather that will run on Sunday September 24th and the KRA season finale on Sunday October 8th. The pre-entry page is up and running if you'd like to save time and money! Click the link to enter online. 9/5/17 - The KRA Series has the weekend off (September 9th-10th) but will return on September 16th and 17th for a Double Header weekend! We look forward to seeing you there! The pre-entry page is up and running if you'd like to save time and money! Click the link to enter online. 8/29/17 - This Sunday September 3rd come celebrate Labor Day weekend at NCMP with the 11th round of the KRA Series! The pre-entry page is up and running if you'd like to save time and money! Click the link to enter online. 8/22/17 - We've had a long stretch of national traveling series at NCMP but this Sunday August 27th the KRA Series is back in action at NCMP! The pre-entry page is up and running if you'd like to save time and money! Click the link to enter online. 8/5/17 - If you are staying in Greenfield - The east bound I-70 on-ramp (going towards New Castle) at the Greenfield exit was closed this week due to bridge construction. Alternate route to New Castle is to take US40 east to State Road 3 and go north to GW Pierce Parkway. The exit ramp west bound at the Greenfield exit IS open so you can take I-70 back to Greenfield. 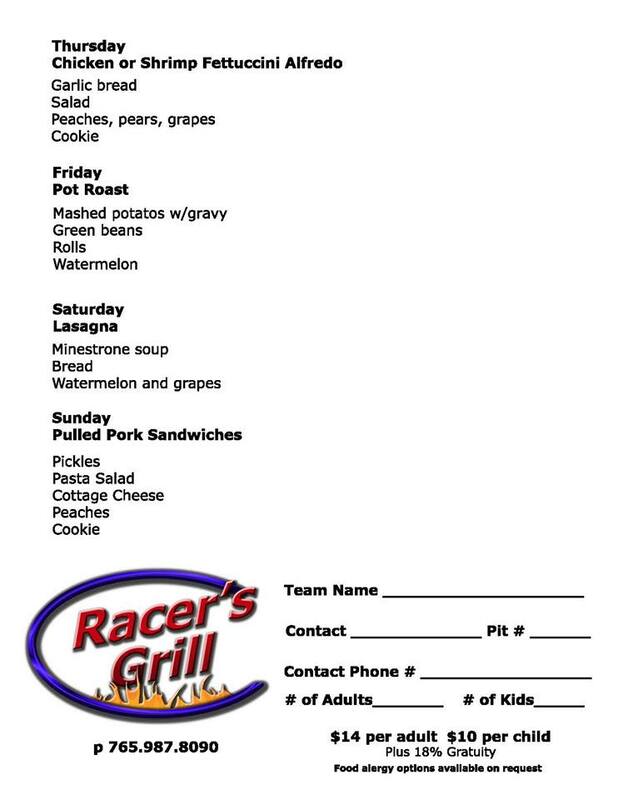 NCMP's restaurant, The Racer's Grill, is offering catering to teams for the SKUSA Summernationals Thursday to Sunday. You can download the order form here. 8/3/17 - This weekend's SKUSA Tune Up will have strutured practice for SKUSA classes only. No Kid Karts or other non-SKUSA classes will practice (Yamaha etc.). Depending on the amount of karts that show up we may do some races as well. Rental Karts will be available on the East Track all weekend. There will be no Kid Kart practice on Wednesday August 9th due to SKUSA move in. 7/21/17 - This Sunday July 21st is the 9th round of the KRA Club Series. The pre-entry page is up and running if you'd like to save time and money! Click the link to enter online. If you encountered an error when trying to enter online on Thursday night into Friday morning, we were switching email servers and you should not have any more issues. Thank you for your understanding. Reminder - There will be no practice available on Saturday July 22nd before KRA race #9. 7/14/17 - The 2017 Race for Riley Children's Hospital is Tuesday July 18th! We have the entry form up if you want to enter online. Come on out and support a great event for an even better cause! Race for Riley schedule is here. There will be no practice available on Saturday July 22nd before KRA race #9. 7/11/17 - This weekend (July 14-16) NCMP will be hosting the WKA Manufacturers Cup national. Come out and see some great kart racing! 7/3/17 - NCMP is closed Tuesday for 4th of July. Also this weekend was supposed to be the ROK Cup Midwest race but ROK officials have cancelled that event. NCMP will be open for practice and rental karts this weekend (July 8th, 9th). 6/30/17 - IMPORTANT NOTICE - Our web hosting company moved servers this week and the only thing we told them that they couldn't do was mess up our email but they messed up our email. So we have lost any preentries that were submitted before 10am this morning (Friday 6/30). If you have preentered for this weekend's KRA races we ask that you please pre-enter again. We apologize for the issue. We have spent the last two days waiting on the email to get fixed and was hoping we had not lost the entries. 6/27/17 - This Sunday July 2nd the KRA Series will have Micro Swift and Mini Swift class available, the Micro and Mini will run on track together with the Micro's starting behind the Mini's. 6/23/17 - For the KRA double header weekend at New Castle (July 1st and 2nd) the Saturday track layout will not be available for practice on Friday (there will still be Friday practice), rental karts will be available on Friday as well. Saturday (July 1st) we will run 3 rounds of practice. Rental karts will not be available on Saturday (July 1st) but will be available on Sunday (July 2nd). 6/19/17 - This Sunday June 25th is the sixth round of the KRA Club Series. The pre-entry page is up and running if you'd like to save time and money! Click the link to enter online. 6/12/17 - The Vintage Karting Association will return to NCMP this Thursday June 15th to Saturday June 17th. The VKA is a unique and fun event and is a great chance to experience the 60+ years of karting history! 6/5/17 - After a few weeks off the KRA Series is back this Sunday, June 11th for the 5th round of the season! The pre-entry page is up and running if you'd like to save time and money. Click the link to enter online. 5/31/17 - Reminder this Saturday June 3rd at NCMP is the return of Lantern Fest! At Lantern Fest you can enjoy live music, dancing, food and when the sun sets you can send off lanterns that will light up the night! It's a great event for families! Check out the Lantern Fest Facebook page and website for all the details and to purchase tickets. 5/17/17 - Lantern Fest is returning to NCMP on Saturday June 3rd! At Lantern Fest you can enjoy live music, dancing, food and when the sun sets you can send off lanterns that will light up the night! Check out the Lantern Fest Facebook page and website for all the details and to purchase tickets. 5/11/17 - The second annual Mother's Day race will be ran this Sunday during the KRA rcae #4. Moms, this is your chance to get out on the track and have some fun! To sign up for the race please contact the track. 5/9/17 - This weekend is the fourth round of the 2017 KRA kart club season! The pre-entry page is up and running if you'd like to save time and money. Click the link to enter online. 4/28/17 - KRA Race #3 is Postponed! We have gone back and forth and watched multiple weather apps over the course of the last week. Given all but one forecast we are going to postpone KRA #3. We are going to reschedule for September 24th. We apologize for any inconvenience this may cause but our main concern is the thunderstorms that are being predicted. 4/25/17 - Attention KRA racers. We have already begun to watch the forecast for this weekend. We know that it changes all the time but would like your input as to what you would like us to do in the event of rain. Would you like to run in the rain or postpone? We also know that some of you drive a fair distance. In the event that the majority would like to postpone, when would you like the call made by? Please visit our Facebook page to weight in or send us an email. The KRA Series returns this weekend for the third round of the 2017 season! The pre-entry page is up and running if you'd like to save time and money, enter online. 4/19/17 - This weekend is the Route 66 season opener! The Route 66 is a great regional series with excellent and friendly competition. For more information on the Route 66 series visit their website. 4/11/17 - NCMP will be open for practice and rentals this Saturday April 15th and closed on Sunday April 16th for Easter. 3/28/17 - This weekend is the first round of the 2017 KRA kart club season! The pre-entry page is up and running if you'd like to save time and money and enter online. 3/22/17 - NCMP will be open for practice starting Thursday 3/23. It looks like the weather will finally cooperate for some track time! The 2017 KRA Membership Form is now available online. 3/21/17 - The KRA Series Kid Kart class will require Bridgestone YLC Tires this season, max tire circumference is 33". 3/14/17 - With temperatures only forcast in the low 40's for this weekend NCMP will be open for garage owners only on Saturday and Sunday March 18th, 19th for move in only, no practice. Access is available from 10am to 4pm. 2/7/17 - KRA will be going to 710x5 YLC rear tires in the Yamaha Junior class for 2017. KRA will allow the 600x5 tires to be ran the first 5 races of the season in addition to the 710x5 YLC tires. After Race 5 the 710x5 YLC will be required. 1/31/17 - The weight for the new LO206 Masters class will be 370 lbs. We know there are big drivers in the class and smaller drivers in the class and coming up with a weight that would make everyone happy wasn't really possible outside of having two separate classes. 1/21/17 - KRA will require that everyone run an LO206 engine in the LO206 classes this season. We allowed the clone engines the last two seasons during the change over but looking to the future of the class, the clone engine will no longer be allowed. 1/10/17 - The KRA Series will be making some class updates and changes for the 2017 KRA season. Tag Heavy #2 and Tag Senior #2 will no longer be offered. The TaG Heavy weight will go up with X30 weighing 405 pounds, Leopard 395 and all other engine makes 415 lbs. to be a true "Heavy" class. As announced this fall, KRA will offer an LO206 Master class. The minimum age will be 40 years old, CIK bodywork, sit up sprint style seats, weight will be announced soon. Also KRA will allow LO206 Junior using a Gold carb slide and LO206 Sportsman using a Green carb slide to run on track with the Yamaha Rookie/Novice class in 2017. After careful consideration the class will use CIK Bodywork and sprint sit-up seats. Other class considerations are being made but it comes down to fitting everything in during the day with a good amount of track time for all classes and trying to end the race day at a reasonable time for everyone. We will be determining a minimum average number of entries a class must maintain to receive year end banquet awards as well. 1/7/17 - The 2017 NCMP and KRA Schedule has been posted! 11/16/16 - Sunday November 20th will be our last open practice day before we close for the winter. Thank you to everyone who has made this season a great one. In the meantime, have a wonderful holiday season. We look forward to seeing everyone back at it again in 2017! 11/4/16 - Starting Wednesday November 9th NCMP will be open from 10am to 5pm. 10/28/16 - The 2016 KRA Series Banquet will take place at NCMP on Saturday, November 19th. We will be posting the banquet form soon. 10/25/16 - On Saturday November 12th New Castle Motorsports Park will host a very unique event, Lantern Fest. At Lantern Fest you can enjoy live music, dancing, food and when the sun sets you can send off lanterns that will light up the night. Check out the Lantern Fest Facebook page and website for all the details and to purchase tickets. 10/17/16 - Thank you to everyone for a great season with the KRA Series! We hope everyone had an enjoyable season. We will be posting information about the KRA Banquet soon! In 2017 KRA will be offering an LO206 Masters class. We are still finalizing details but the class will use CIK bodywork, sprint style seat and the class age will be a minimum of 40 years old. We will be posting more information on the class at a later date. 10/6/16 - This weekend is the final race of the 2016 KRA Series season! We will be running the full NCMP track layout on Sunday and the track layout will be available for practice on Saturday! The pre-entry page is up and running if you'd like to enter online. Also don't forget about the NCMP Night of Comedy on Saturday night! Information is below. 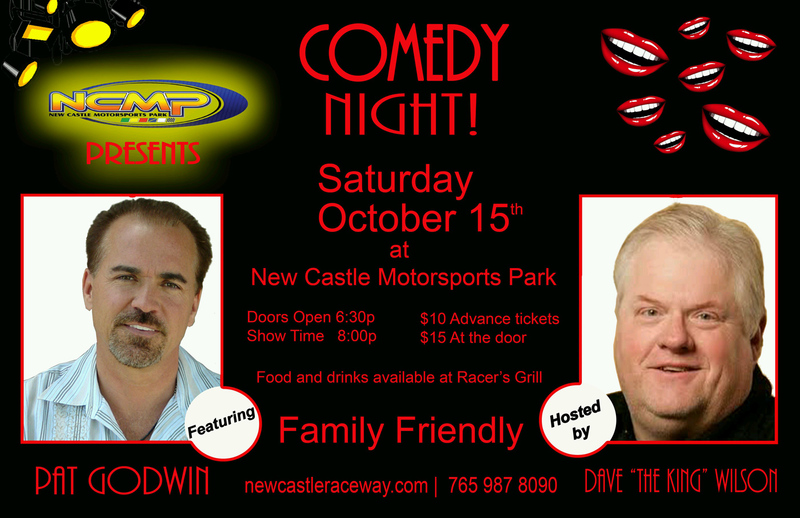 10/6/16 - On Saturday October 15th NCMP will host a Night of Comedy! Doors will open at 6:30pm with the comedy show starting at 8pm. 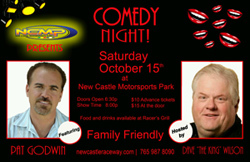 This family friendly show will feature Pat Godwin and hosted by Dave "The King" Wilson. See the flyer for more information and you can order tickets here. 10/3/16 - This weekend is the next to last round of the 2016 KRA Series season! The pre-entry page is up and running if you'd like to enter online. 9/22/16 - 2016 Robopong 200 Cancelled - With great disappointment, New Castle Motorsports Park must announce the cancellation of the 2016 Robopong 200. Despite a large social media campaign to help secure enough entries to put on a successful event the amount of entries received over the last couple weeks was unfortunately not enough. NCMP has every intention of bringing the Robopong 200 and support races back, bigger and better, in 2017. A few seasons ago the Robopong 200 easily fit on most karters calenders with no races within 2-3 weeks of the race. It was a great way to end the season for many racers with a fun, unique, stand-alone event. With the current increase in regional and national series, the Robopong 200 is now surrounded by numerous karting events. With a summer full of races, many back to back to back, we have seen a dramatic dropoff in entries as the season has gone on in most series and unfortunately the economics of this situation has also affected the Robopong 200. With all this in mind we will be carefully scheduling the Robopong 200 in 2017 to mitigate this new reality in karting as much as possible. We are also looking for cost reduction measures for the event as well. Our hope is to increase the fun factor and decrease the cost. The Robopong 200 is possibly the most unique event in US Karting with karting’s top drivers competing alongside some of motorsports biggest stars! We want this tradition to continue but only if we can give the race the true attention and support it deserves. Thank you to everyone who has entered the race for 2016 and thank you to everyone who tried to help us secure enough entries to hold this year’s race. The karting landscape has changed and the Robopong 200 has to adapt to these changes. We know the Robopong 200 can stand on its own in the future and we will do everything we can to put on the best Robopong 200 yet in 2017. 9/14/16 - Many in karting have noted with the addition of numerous National traveling series over the last few years that the amount of karters traveling to large events has decreased overall and it appears the Robopong race has not been immune to this. NCMP has decided to place a deadline on our decision to hold this year's Robopong event based on the number of entries we receive by Thursday September 22nd. We ask that you please enter the Robopong 200 or the support races by that date. Your entry could determine whether the event is held this year or not. We appreciate everyone's understanding. 9/6/16 - NCMP will be open this weekend (September 10th-11th) for practice and rentals. Rental karts will not be available on Saturday until 2pm. 8/31/16 - KRA Series Race #11 is this Sunday September 4th! The pre-entry page is up and running if you'd like to enter online. There will be no rental karts available this weekend (Sept 4th-5th). NCMP is also closed on Labor Day. The entry form and information for the Robopong 200 weekend has been updated. 8/26/16 - We are excited to announce that the Henry County EDC along with the help of Tom Saunders have been able to approve the paving of the access road back to our facility! There will be an alternate route to take during the construction process. It is accessible by any means that you normally take to the track, including semis. There are signs up on the detour marked "Motorsports Park". 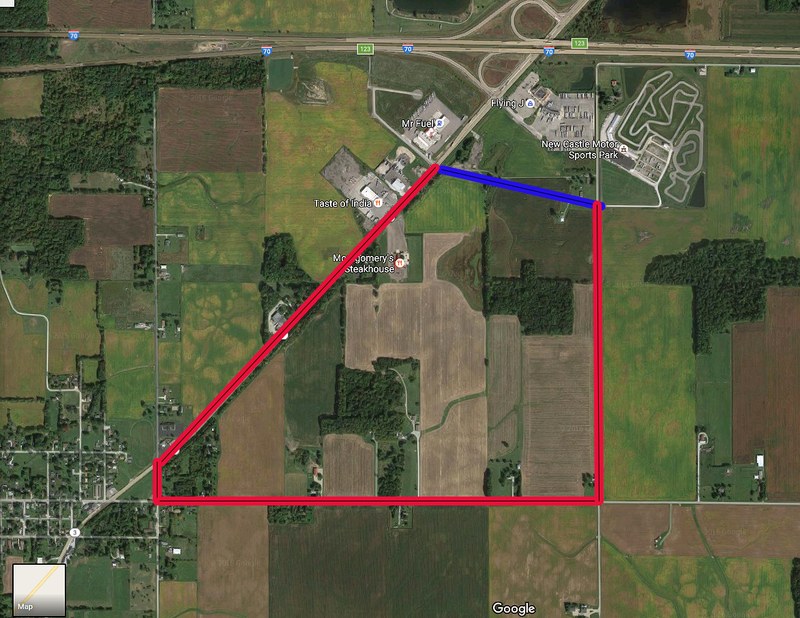 We have a detour map available here with the detour marked in red. If you have any questions regarding the alternate route please call us at 765.987.8090. We appreciate your understanding during this process and look forward to the finished product! 8/22/16 - This weekend will see the Rok Cup series compete at NCMP for the first time! See the ROK Cup website for all the details! 8/16/16 - After a long summer break the KRA Series is back at it this Sunday! The KRA Series race #10 is this weekend with only 4 KRA races left this year. The pre-entry page is up and running if you'd like to enter online. 8/13/16 - OVKA has cancelled their race Sunday (8/13) because of rain (OVKA does not run in the rain) and NCMP will be closed on Sunday. NCMP will be open on Saturday from 10am to 3pm if it rains so garage owners may have access to their garages and racers can practice. If it is dry on Saturday NCMP will be open until 6pm. 8/11/16 - The Ohio Valley Karting Association will be making their annual trek to NCMP this weekend! OVKA is a Bridgestone tire series like KRA with many overlapping classes. For more information on OVKA please visit their website. Starting the week of August 15th, NCMP will be closed Monday's and Tuesday's. 7/26/16 - The WKA Gold Cup 4 Cycle National series will be making their return to NCMP this weekend! We hope you can make it out to see this unique event. 7/26/16 - This Saturday July 30th is ProCup karting where you can rent a kart and race! ProCup karting provides everything. More information is available here. You can also visit their website here. 7/13/16 - We have released the Race for Riley raceday schedule. Also the entry form is online if you would like to enter. Classes and tire rules are available on the entry form link. 7/5/16 - The 2016 Race for Rileys Children Hospital will take place on Tuesday, July 19th. This is the week of the SKUSA race. SKUSA is allowing their racers to race in the Race for Riley if they wish. The entry form is online if you want to see the classes available. 6/29/16 - NCMP will not have rental karts available on Saturday July 2nd but rental karts ARE available on Sunday July 3rd. 6/27/16 - This Saturday and Sunday (July 2nd-3rd) will be a KRA Series Double Header Weekend! The pre-entry page is up and running if you'd like to enter online. 6/23/16 - NCMP will be running Sunday's KRA track layout on Saturday for practice. NCMP hours on Saturday will be 10am to 6pm. There will be No Rental Karts available Saturday or Sunday. 6/21/16 - KRA Series Race #7 is this Sunday! The pre-entry page is up and running if you'd like to enter online. 6/1/16 - NCMP will run the Saturday's backwards layout for practice on Friday June 3rd. The KRA Series is back this weekend with a Double Header! KRA will race on Saturday June 4th and Sunday June 5th. The pre-entry page is up and running if you'd like to enter online. 5/26/16 - NCMP will be closed on Sunday May 29th and will be open on Monday May 30th (Memorial Day) for practice and rental karts starting at 10am. 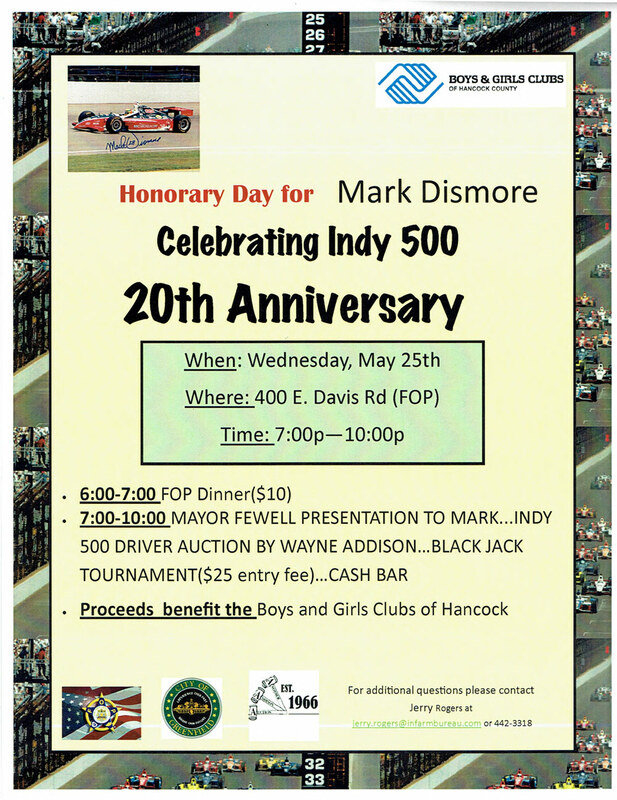 5/19/16 - The city of Greenfield will be honoring Mark Dismore on Wednesday May 25th from 7pm to 10pm at the Greenfield FOP on the 20th anniversary of his first Indianapolis 500 start. Everyone is welcome, there will be a dinner, driver auction and black jack tournament with proceeds benefiting the Boys and Girls club of Hancock County. See the flyer for all the details. 5/12/16 -This Sunday the Ohio Valley Karting Association will be visiting NCMP for their club race. OVKA runs Bridgestone tires and many classes that are similar to KRA. For more information on OVKA please visit their website. 5/12/16 - This weekend NCMP is hosting the opening round of the 2016 United States Pro Kart Series! Come out to NCMP this Saturday and Sunday to watch great racing with some of the best karters in the USA! 5/5/16 - Hey karting moms! Have you ever wondered what it would be like to get behind the wheel of a kart? If so you’re in luck. NCMP Presents a mother’s day celebration to rival all others. As a way to say thank you for always being there, NCMP is hosting a Mother’s Day time trial event to be held during KRA #4 Sunday May 8th. Top 3 fastest lap times will receive cool prizes and bragging rights. Sign-ups will be the day of the race. Contact the track for more information 765-987-8090. KRA Series Race #4 is this Sunday May 8th! The pre-entry page is up and running if you'd like to enter online. 4/27/16 - KRA Series Race #3 is this Sunday! We will race rain or shine. The pre-entry page is up and running if you'd like to enter online. 4/18/16 - This weekend (April 21st to 23rd) is the first regional race of the year to visit NCMP with the Route 66 Series kicking off their season! For more information on this fun and competitive series visit their website here. 4/11/16 - The April 10th KRA race was postponed and will run on Sunday April 17th. This Sunday is the second round of the KRA Series and we have the pre-entry page is up and running if you'd like to enter online. 3/26/16 - The KRA Series first race of 2016 is only a week away on Sunday, April 3rd! The pre-entry page is up and running if you'd like to enter online. 2/18/16 - NCMP is currently accepting job applications for a position to be filled ASAP. For details please contact Shelby Armstrong at 765-987-8090. 1/14/16 - The 2016 NCMP and KRA Series schedule has been posted - REVISED ON 1/15/16. 11/27/15 - Derek Daly is hosting a free Career Development Seminar for drivers and their parents on Saturday, December 12th from 8am to 9am at the Indianapolis Convention Center during the PRI Show. Click here for more information. 11/25/15 - NCMP is closed for the season after Wednesday 11/25/15. Garage owners please call or email the track to make an appointment for access to your garage. 10/26/15 - The 2015 KRA Banquet Form is available for download here. 10/19/15 - The KRA Series banquet is scheduled for Saturday, November 14th. We will post the banquet form and more information very soon. KRA season ending points with drops added in have been posted. Please look at your points and results and make sure you don't see a mistake. Please let us know if we need to look into something well before the KRA Series banquet! 10/15/15 - NCMP is open for practice and rentals this weekend. There IS a corporate event from 10am to 2pm on Saturday 10/17. Practice and rentals will be available after 2pm on Saturday and from 10am to 6pm on Sunday. 10/5/15 - The 2015 KRA Series Season Finale is this Sunday, October 11th! Hard to believe another season is almost in the record books. We look forward to seeing you this weekend! The pre-entry page is up and running if you'd like to enter online. 9/28/15 - Only two KRA races left in the 2015 KRA Series season! This Sunday, October 4th is the 13th of 14 rounds of the KRA Series at NCMP! We look forward to seeing you this weekend! The pre-entry page is up and running if you'd like to enter online. 9/4/15 - The Yamaha Junior Sportsman class weight will be lowered from 250 lbs. to 240 lbs. effective immediately for the KRA Series. This does not include Robopong. 9/1/15 - This is the last week to pre-enter the Robopong 200 before the entry fee increases! The entry fee increases after Saturday 9/5/15 so get your entries in for the Robopong 200 and the support races. The entry page for the 2015 Robopong 200 and Robopong support races is up and going. 8/31/15 - This Sunday, September 6th is the 12th of 14 rounds of the KRA Series at NCMP! We look forward to seeing you this weekend! The pre-entry page is up and running if you'd like to enter online. 8/24/15 - The KRA Series has had a few weeks off but it's time for Round #11 this Sunday August 30th! We look forward to seeing you this weekend! The pre-entry page is up and running if you'd like to enter online. 8/18/15 - This weekend at NCMP the United States Pro Kart Series will hold their final event of the 2015 season! Some of the best karters in the country will be on track competing for championships and race wins. As always NCMP has free specator viewing and pit passes are also available for a small fee. It's a great weekend to come out to NCMP and see some incredible racing! 8/6/15 - The entry page for the 2015 Robopong 200 and Robopong support races is live. We will also be adding the Mini Swift class to the 2015 Robopong support races this year. 8/5/15 - Starting Monday, August 10th, NCMP will be closed on Mondays and Tuesdays. 8/3/15 - The Ohio Valley Karting Association is visiting NCMP this weekend! OVKA runs Bridgestone tires and many classes that are similar to KRA. For more information on OVKA please visit their website. 7/28/15 - After a three week break, this Sunday August 2nd is the KRA Series Round #10! We look forward to seeing you this weekend! The pre-entry page is up and running if you'd like to enter online. 7/21/15 - There will be practice at NCMP on Thursday (July 23rd) from 2pm to 8pm for SKUSA competitors only. 7/20/15 - This weekend is the SKUSA Summer Nationals at NCMP and it is shaping up to be one of the biggest events in SKUSA history! This is a great opportunity to come out to New Castle and see some incredible kart racing in person. The races will take place on Saturday and Sunday, bring a lawn chair and come on out! 7/13/15 - The WKA Manufacturers Cup will be at NCMP this weekend! NCMP will have practice for any WKA Manufacturers Cup racers on a modified track layout this week if you'd like to test at NCMP ahead of the weekend. We have released the race day schedule for the 2015 Race for Riley on Tuesday July 21st. 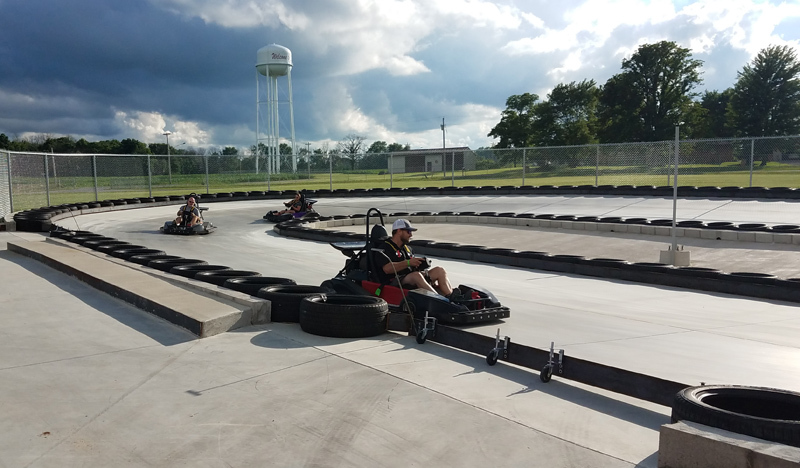 7/6/15 - Endurance Karting is bringing Arrive and Race Karting to the 1 mile track at at New Castle Motorsports Park on July 12th. Endurance Karting provides all the karts and even has all the safety gear necessary to race. Everything is provided but the excuses. Saturday, July 11th there are practice sessions and schools and Sunday there are three 2 hour races. Enter 1 race or all three and save 10%! 7/1/15 - This Sunday July 5th is the KRA Series Round #9! We look forward to seeing you this weekend! The pre-entry page is up and running if you'd like to enter online. NCMP will be open for practice on Saturday, July 4th. 6/27/15 - The X30 will now run at the same weight as the Leopard engine in the TaG Classes with KRA. 6/25/15 - NCMP will have practice on Saturday June 27th on the layout that will be used Sunday for the KRA Series Race #8. 6/24/15 - The KRA Series returns this Sunday June 28th for Round #8! We look forward to seeing you this weekend! The pre-entry page is up and running if you'd like to enter online. 6/16/15 - The Vintage Karting Association will be at NCMP this weekend (June 18th-20th) to race and display karting from it's inception to the present day. The Vintage Kart weekend is a great chance to see karting's history! Spectators are welcome. 6/10/15 - This weekend is a KRA Double Header race! KRA Round #6 and #7 (halfway!). We hope to see you there! The pre-entry page is up and running if you'd like to enter online. The Racer's Grill will be open this Friday June 12th during open practice from 10am to 3pm. MG Whites will be available at the track as well as VP Racing Fuel. You can enter the Race for Riley online. This is a great opportunity for SKUSA racers to race at NCMP as well as a great chance to put real kart racing in front of hundreds of non-racers and members of the media. 5/13/15 - The KRA Series will be running a Double Header race this weekend May 16th and 17th! KRA will run rain or shine this weekend and after taking a survey the Kid Kart class will also run rain or shine. We look forward to seeing you this weekend! The pre-entry page is up and running if you'd like to enter online. 5/11/15 - The Racers Grill will be open this Friday (May 15th) during practice. 5/7/15 - We are sad to announce the father of KRA's head grid-man Gordon Juhasz passed away earlier this week, John Juhasz was 92. John Juhasz was a fixture on the National Enduro karting scene for 30 years helping his son Gordon win numerous National events and championships. John will be missed by all of us. More information on John. The Racer's Grill will be CLOSED this weekend. The track will be open for open practice and rentals all weekend. 5/1/15 - Looks like beautiful weather is on tap for this Sunday's Third Round of the KRA Series! The pre-entry page is up and running until Friday night at midnight if you'd like to enter online. 4/28/15 - Congratulations to past KRA points champion and two-time Robopong 200 winner Josef Newgarden on his first IndyCar victory last Sunday at Barber Motorsports Park! Josef started his karting career at NCMP in the Yamaha Sportsman class! The IndyStar wrote a nice story about Josef and the start of his racing career in karts! 4/17/15 - This Sunday's (April 19) KRA Series race is postponed until next Sunday April 26th. 4/16/15 - Due to the inclement weather in the forecast for this Sunday April 19th there is a chance that KRA #2 may be postponed to the following Sunday April 26th. The possibility of moving the race is based on equipment preservation for all competitors as well as facility preservation. We would like to wait until Sunday to make the call but that is not feasible as many people will already be on the premises. With that said, we intend to make a decision by 4pm on Friday based on the forecast at that time. We feel that is the best possible way to proceed with everyone’s interest in mind. Watch the website and Facebook for updates. 4/9/15 - Starting this weekend at the first KRA Series race of 2015, KRA will require competitors in ALL classes to run the NCMP provided track fuel. We have 110 octane and 93 octane racing fuels on site. Use of NCMP race gas will be strictly enforced for KRA races. 4/6/15 - KRA will offer the TaG Junior class in 2015. The class will follow the WKA IAME Pro Junior class rules and weight. TaG Junior will qualify and race with the TaG Senior class on KRA weekends. Adding this class will allow karters to test and tune for the USPKS, WKA and SKUSA Summernationals at NCMP this season. 4/4/15 - The first race of the 2015 KRA Series season is Sunday April 12th! The pre-entry page is up and running if you'd like to enter online. 4/2/15 - NCMP will be closed on Sunday April 5th for Easter. 3/13/15 - The Racers Grill at NCMP will be open on all Saturday's and Sunday's beginning March 14th and select Friday's in 2015. Thank you for supporting the Racer's Grill! With WKA reintroducing the shifter class and the SKUSA Summer Nationals taking place at NCMP in 2015, KRA will allow Bridgestone YLB or YLC tires as well as MG FZ Yellow Tires (450/460x5 fronts, 710x5 rears) in the KRA shifter class. We hope having more choice in the class will allow drivers to test and prepare for the two series and help stimulate the shifter class at NCMP and KRA. 3/3/15 - The 2015 NCMP opening date has been pushed back a week thanks to Mother Nature. We now hope to open on Saturday March 14th weather permitting. Hopefully the snow will only be a memory by the 14th! 1/28/15 - The 2015 NCMP Schedule is now online! 1/24/15 - The 2015 NCMP race schedule is almost ready but trying to accommodate all series and races is a lot of work. We hope to post the schedule in the next week or two. If we post it now we will just have to change it in a few days. Thank you for your patience. 1/16/15 - The Yamaha Junior classes will remain on 600x5 YLC rear tires for 2015. There was talk of going to 710x5 tires but the class will remain unchanged for 2015. 11/10/14 - Here is the 2014 KRA Series banquet form. 11/5/14 - The KRA Series banquet will take place on Saturday, December 6th. We will be sending out RSVP's next week with all the information. This will be the last weekend that NCMP will be open for garage owners. After this weekend garage owners will need to make an appointment to access their garage. 11/1/14 - Due to the cold temperatures NCMP will be open from 11am to 4pm today (Saturday November 1st) for garage owners only. There will be no open practice or kart rentals Saturday. Sunday NCMP will be open from 11am to 4pm and we will have open practice and rentals available on Sunday November 2nd. Remember tonight is the start of daylight savings time, set you clocks back 1 hour. 10/31/14 -Don't forget, if you have a water cooled engine in your garage at NCMP you need to make sure you drain the water before freezing temps hit! If you'd like the staff at NCMP to take care of it for you please call the track. 10/29/14 - As we wind down the karting season, NCMP will be open Wednesday-Friday 11am to 5pm and Saturday-Sunday 10am to 5pm. 10/25/14 - We still have a limited amount of event shirts from the 2014 Robopong 200 and 2014 Dan Wheldon Memorial ProAm available. You can purchase them at the track or online at Comet Kart Sales. 10/23/14 - For Sunday's KRA Season Finale we will have LeMans style starts for all classes. No running to the karts though. 10/20/14 - The KRA Season Finale is this Sunday October 26th! Final chance of 2014 to race at NCMP until next spring! The pre-entry page is up and running if you'd like to enter online. KRA will run the same track layout this weekend as we did last weekend. With the shorter amount of daylight this time of year this layout will help us fit in the complete schedule. Rental karts will be available Saturday and Sunday. 10/16/14 - This Sunday is round #14 of the KRA Series! Only one race left for the 2014 season after this weekend! The pre-entry page is up and running if you'd like to enter online. Due to safety concerns, NCMP will no longer allow GoPro and other onboard cameras to be attached to the helmet or driver in any fashion. Cameras may be securely fastened to the kart but not the driver. Rental Karts will be available this weekend. Friday, Saturday and Sunday. 10/13/14 - NCMP is now closed on Tuesday's and we will be closed this WEDNESDAY (October 15th) as well. 10/8/14 - We will run Sunday's KRA race configuration during Saturday practice. Practice starts at 1:30pm Saturday due to a corporate event in the morning. 10/7/14 - After a few weeks off, this Sunday is the KRA Series Race #13! The pre-entry page is up and running if you'd like to enter online. Only three races left this season for the 2014 KRA Series! 10/6/14 - NCMP will be closed this Tuesday (October 7th) and NCMP will be closed on Monday's and Tuesday's from here on out as we wind down the 2014 season. 9/23/14 - The 2014 Robopong 200 Presented by Bridgestone and the Dan Wheldon Memorial ProAm Karting Challenge are both in the books. Thanks to all the sponsors, competitors, spectators, volunteers and staff that make this event possible. Thanks to ekartingnews.com for their coverage of the event and they have a complete recap of the Robopong 200 here. 9/10/14 - With the cancellation of the SKUSA Shifterfest race that was scheduled for this weekend (September 13-14), NCMP will be open for practice and kart rentals Saturday and Sunday from 10am to 6pm. Come on out for some karting fun! See Saturday's Robopong schedule for ProAm practice and race times. 9/4/14 - The SKUSA Shifterfest race scheduled for September 12-14 has been cancelled. 9/2/14 - This Sunday is the KRA Series Race #12! The pre-entry page is up and running if you'd like to enter online. The KRA Race that was postponed a few weeks ago will be made up on Sunday, October 26th. 8/26/14 - NCMP will be open Labor Day Weekend for open practice and rentals. Saturday and Sunday August 30th, 31st, open 10am to 6pm. NCMP will be closed on Monday for Labor Day. 8/20/14 - We will run KRA's track configuration for Sunday during Saturday practice if you'd like to come out and get some laps in on Saturday. 8/19/14 - After an extended break, to make room for some National events visiting NCMP, the KRA Series is back this weekend for Race #11 of the 2014 KRA season! The pre-entry page is up and running if you'd like to enter online. 8/11/14 - This weekend is the United States Pro Kart Series season finale at NCMP. The USPKS will be a fun event, we hope you can make it out to check out the action! 8/4/14 - A reminder to all KRA Members, Bridgestone is offering KRA members a 1 for 1 offer on entries at this weekends WKA Manufacturers Cup Race at NCMP. WKA will be running the Ironman track layout. Example - If a KRA member enters 2 classes at the WKA race, Bridgestone will pay for 2 entries at any KRA series club race at NCMP. This offer applies to both the August and October WKA events as well as the Great Lakes Sprint Series race August 29th-31st. The KRA entries can be used during the 2014 or 2015 season. In addition, Bridgestone will pay $100.00 per class to any KRA member that wins a Manufacturers Cup race at either NCMP WKA race. WKA also has added a local option Yamaha Senior Can class for both Manufacturers Cup rounds at NCMP. You can download the entry form for the NCMP WKA race on the WKA website. 7/30/14 - This weekend is the Route 66 Kart Series. Route 66 runs MG Tires, you can find out more by going to their website. 7/25/14 - KRA will run if it rains Sunday. The pre-entry page is up and running if you'd like to enter online. 7/18/14 - Click here for the 2014 Race for Riley raceday schedule. 7/14/14 -With the postponement of last Sunday's KRA race, we will not be running a double header on July 26th because of the short notice. We will reschedule the postponed event for a later date once we have had more time to look at the schedule. The KRA race on Sunday July 27th will run as scheduled. We won't be listening to the weatherman anymore that's for sure! Want to race against John Andretti in the NCMP Corporate Karts during the 18th Annual Race for Riley's Children Hospital on Tuesday July 22nd? Go to the Race for Riley website to sign up! You can also now enter the Race for Riley COMPETITION CLASSES online. This is for karters who own their own karts. The entry for the competition classes is free, just buy pit passes! 7/9/14 - This Sunday, July 13th is the 9th round of the KRA Series. The pre-entry page is up and running if you'd like to enter online. Saturday practice will take place on the track configuration we are running on Sunday. Rental karts WILL be available on Saturday but not Sunday. 7/7/14 - NCMP has two WKA Manufacturers Cup races this year. The first race will be August 8th - 10th, the second Manufacturers Cup race is October 3rd - 5th. Bridgestone is offering KRA members a 1 for 1 offer on entries. Example - If a KRA member enters 2 classes at the WKA race, Bridgestone will pay for 2 entries at any KRA series club race at NCMP. This offer applies to both the August and October WKA events. The KRA entries can be used during the 2014 or 2015 season. In addition, Bridgestone will pay $100.00 per class to any KRA member that wins a Manufacturers Cup race at either NCMP WKA race. You can download the entry form for the NCMP WKA race on the WKA website. 7/3/14 - The Racer's Grill will be open for lunch July 4th and 5th from 11:00am to 4:30pm each day. 7/1/14 - We will be using Class Rotation #3 for Sunday's KRA race. We will offer practice on Saturday for Sunday's track configuration. 6/30/14 - Round #8 of the 2014 KRA Series is this Sunday July 6th! The pre-entry page is up and running if you'd like to enter online. NCMP will be open on July 4th for open practice and rentals karts from 10am to 7pm. 6/17/14 - This weekend is the KRA Double Header event with full race days on Saturday and Sunday! The pre-entry page is up and running if you'd like to enter online. 6/13/14 - NCMP will be open Sunday, June 15th for Open Practice and Rental Karts from 10am to 6pm. Bring your dad out for Father's Day for a little wheel to wheel kart action! The Racer's Grill will be open Sunday from Noon until 4pm. 6/9/14 - Starting Thursday June 12th to Saturday June 14th the Vintage Karting Association will be at NCMP. If you have never attended the Vintage weekend at NCMP you should definitely come out and check out this very unique event! See the website for more information. NCMP will have Methanol available at the track for the Vintage weekend. 5/29/14 - Check out our Facebook page for new photos of the paving of our parking lot! 5/13/14 - KRA Race #4 is this Sunday May 18th. We will be running this configuration and we will have practice on that layout Saturday May 17th. The pre-entry page is up and running if you'd like to enter online. 4/30/14 - KRA Race #3 is this Sunday May 4th and we have a fun, backwards track layout for this race! 4/24/14 - With WKA moving their Pitt Race date to MRP, NCMP will now host two rounds of the WKA Manufacturers Cup in 2014. We have had to move one of our KRA dates to accomodate the WKA race. Please see the schedule page for the updated 2014 schedule. 4/17/14 - NCMP will be open on Saturday (April 19th) for open practice and rentals from 10am to 7pm and Closed on Sunday (April 20th) for Easter. NCMP is closed on Monday's. 4/8/14 - KRA Race #2 is this Sunday April 13th! The pre-entry page is up and running if you'd like to enter online. 4/2/14 - A reminder, to score points towards the KRA season ending banquet you have to be a KRA Member. You can print off the form online or sign up for membership at the track. Anyone can race KRA series races but only KRA members are eligible for points and season ending prizes at the banquet. 3/31/14 - The first KRA Series race for 2014 is this coming Sunday April 6th! Considering the awful weather we have had all winter you never know what the weekend will bring and in the event of rain we will reschedule the season opener but so far the weather looks like it will cooperate for Sunday. The pre-entry page is up and running if you'd like to enter online. 3/24/14 - Friendly reminder, NCMP is closed on Monday's. See our Hours Page for all practice hours including updated Kid Kart practice days and times. 3/1/14 - Friendly reminder, all KRA banquet certificates expire on April 1st. Certificates will not be honored after that date! The age for the TaG Sportsman class at KRA will lower from 45 years old to 39 years old for those who have won a KRA championship. 2/3/14 - KRA will be making a class rule change to the Clone classes for 2014. Both the Senior and CIK Clone classes will allow the Briggs LO206 engine. The class will be referred to as the Briggs 206/Clone CIK and Briggs 206/Clone Senior. We have had a lot of requests to add the LO206 and after talking to competitors in the clone class from last season 90% supported addding the L206. Engine builders and competitors that have ran both engines say the LO206 should have more torque and the Clone should have more top end. Weight will be the same with either engine. See the classes page for complete rules. 2/1/14 - We are pleased to present the 2014 New Castle Motorsports Park schedule!